There’s a relatively new technology in grills that can provide all of the advantages of traditional grilling while eliminating many of its flaws. It’s called infrared grilling, and it allows for more even heat distribution, cuts down on flare-ups, and even helps you save energy. In this article we’ll cover the technology behind infrared grills, the advantages over traditional grilling, and which models you should consider before choosing the best infrared grill for your needs. Our #1 choice for best infrared grill! Our pick for the overall best infrared grill on the market is the Char-Broil Signature TRU-Infrared 420. It provides a huge amount of cooking space, durable cast iron grates, and a 13,000 BTU side burner, all wrapped up in a sleek, stainless steel exterior. The Char-Broil Performance TRU Infrared 300 is a more modest version of our top choice. While it’s smaller and lighter, it still provides 300 square inches of primary cooking area, folding side shelves, and a convenient cabinet storage space. If charcoal is your fuel source of choice, the Char-Broil TRU-Infrared Kettleman Charcoal Grill is the one for you. The most convenient grill on our list is definitely the Char-Broil TRU Infrared Electric Patio Bistro 240, which simply plugs into a standard outlet. If you want a small, light, and portable infrared grill, go for the Solaire SOL-EV17A, which weighs in at a mere 15 pounds. While traditional grills often have hot and cold spots, infrared grills create a more evenly heated grilling surface. Infrared elements greatly reduce or eliminate the chance of flare-ups, which can be dangerous and burn your food. The intense heat from infrared grills creates deliciously crusty sears. Infrared grills are typically more efficient, using less energy than traditional grills to reach the same temperatures. Infrared technology is more accessible than ever, but not all infrared grills are created equal. Play it safe and stick to reputable brands: here we’ve gone mostly with the manufacturer of the greatest number of infrared grills on the market, Char-Broil. However, don’t count out Solaire, which is an older, family-operated manufacturer. All of the grills in our list are excellent and worth purchasing, but depending on your own specific needs, some may fit your life better than others. Foremost for many prospective purchasers is size – no matter how perfect a grill, there’s no point of purchasing it if it won’t fit in the space you have. And even if a grill does fit, you shouldn’t purchase a behemoth of a grill if you typically cook for yourself or one or two other people. Not only do larger grills take up more space, but they also take longer to preheat. And if you need to store away your grill in the wintertime or move it for whatever reason, that’s going to be much more difficult with a large, heavy grill. Another hugely important consideration is what fuel the grill uses. There are three types to choose from in this list: gas, electric, and charcoal. If you live in an apartment or community with rules regarding grills, be sure to choose a grill that won’t get you in trouble. While none of the grills on this list are especially complicated, some are more simple than others. If you really value ease of use, know that the electric Patio Bistro 240 just needs to be plugged in before you’re ready to get cooking. The TRU-Infrared 420, TRU-Infrared 300, and the Solaire SOL-EV17A are hardly more complicated, utlizing propane gas. The Kettleman takes the most time and effort to get cooking, since you’ll have to light up charcoal. 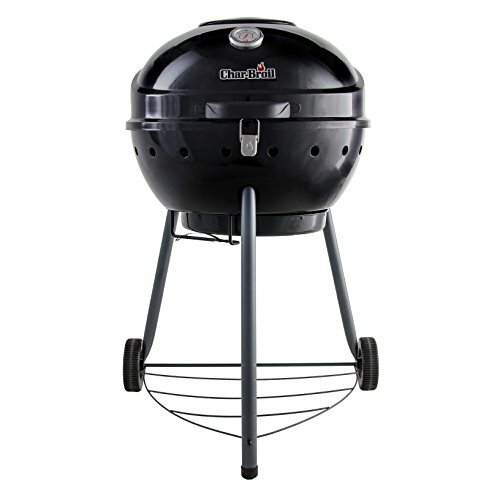 However, we know a lot of folks prefer the taste of charcoal, and that’s why we included this grill in our list. Char-Broil’s Signature TRU-Infrared 420 is our #1 overall choice for best infrared grill. If you’re looking for a large, beautiful grill with all the bells and whistles for your deck or patio, this is the one for you. 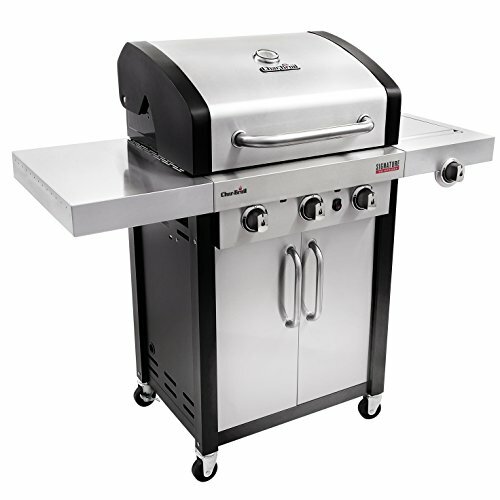 This grill features a 420 square inch cooking surface, which is the largest area on this list, as well as three individually adjustable burners, giving you even greater control. It also has a 155 inch warming rack. For perspective, the area of the warming rack is larger than total grilling area of the portable Solaire model at the end of our list. As a bonus, it also has a smaller side burner hidden underneath a cover on one of the side shelves, ideal for preparing sides and sauces. Like the Char-Broil 300 model below, this grill operates on of a full-sized propane tank and has the ability to be converted to natural gas. Its cast iron grates are incredibly durable. It also has a spacious cabinet area for storage underneath the grill. The main drawback of this grill is that it’s just not the right fit for everyone. At just over 130 pounds, it’s easily the largest on our list – and some folks just don’t need that. However, if you often grill for friends and are looking for a large, visually impressive, feature-rich grill, this is an ideal model. If you like the idea of having a relatively large infrared grill for your backyard, but the 420 model above just seems like too much, then Char-Broil’s Performance TRU Infrared 300 is likely the best infrared grill for you. Think of the Performance 300 as the “little brother” to the Signature 420 above. This model has two individually adjustable burners rather than three, but it still provides plenty of space with 300 square inches of cooking space. It also has folding side shelves and a generously sized warming rack. 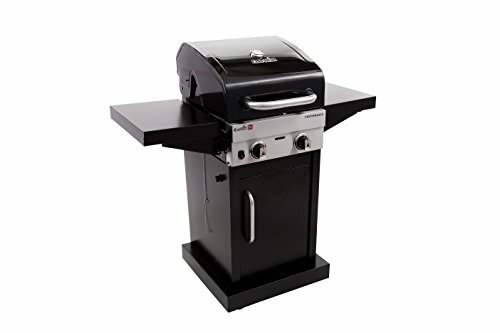 And like the 420 model above, this grill has a convenient storage cabinet, which is great for stashing away your grill brush, foil, and other tools. It also has porcelain-coated grates, which are both easy to clean and resistant to rust. While it doesn’t have a side burner, this grill is capable of doing everything its “big brother” model can, albeit on a smaller scale. If you don’t do much entertaining or just don’t like the idea of having a 130+ pound grill, then you might find this Performance TRU Infrared 300 model to be a more reasonable alternative. The Char-Broil TRU-Infrared Kettleman Charcoal Grill, which also makes an appearance on our ‘Best Charcoal Grills’ list, is the only grill on this list that is fueled by charcoal. This makes the Kettleman a must-have for charcoal fans, but don’t immediately discount it if you’ve tried charcoal in the past and not been the biggest fan. The infrared technology helps to soften some of the negative aspects of using charcoal grills. For example, it uses far less charcoal than the traditional alternatives, and it will radiate a much more even and controllable heat. Even with infrared technology and adjustable vents, the Kettleman will still be a bit more finicky when finding and maintaining the correct temperature compared to its gas-powered alternatives, but it can also provide higher heat and a smokier taste than any of the other grills on this list. And note that the hinged lid does have a temperature gauge to help you monitor the heat level. It has a removable ash pan, but the grates may be harder to clean than the easily adjustable gas and propane grills. This grill ranks high on performance, but even for an expert, it won’t be as straightforward as the alternatives. It really comes down to whether or not you’re a fan of charcoal. If you believe grilling means taking the time to light up charcoal rather than simply burning propane, then this is the infrared grill for you. With a retro clam-shell design, the Char-Broil TRU Infrared Electric Patio Bistro 240 is one of the most distinctive looking grills on the market. It is unique among this list for being an electric grill. That means no fussing with propane gas or charcoal – just plug it in and use a simple knob for temperature control. The grill’s cooking surface is 240 square inches, making it large enough to handle burgers and hot dogs for a crowd, or a few large items, like whole chickens or a rack of ribs. It also features a handy warming rack just above the main grate, allowing you to manage multiple foods with different cooking times more easily. The folding side shelves give this grill a generous amount of space for preparation and storage. The grates are made of porcelain-coated cast iron, which are both tough and easy to clean. Underneath the grill you’ll find a handy grease tray, which is removable for simple clean-up. If you want an electric infrared grill, the Char-Broil TRU Infrared Electric Patio Bistro 240 is the obvious choice, and for the fuel-agnostic, its middle-of-the-road size and simple controls make it an attractive option for anyone. 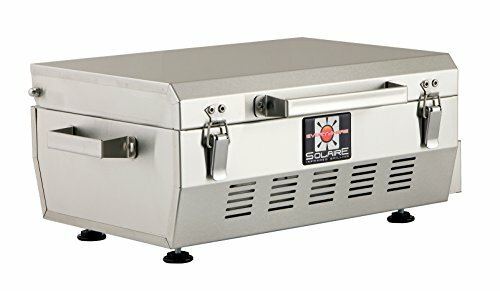 The Solaire SOL-EV17A Everywhere Portable Infrared Propane Gas Grill may be small, but don’t underestimate it – what it lacks in size, it makes up for not only in its quality of construction, but in being one of the easiest to use infrared grills on the market. All you need to start cooking is to attach a 1-lb propane cylinder to the table-top grill, hit the ignition, and wait less than five minutes. Open up the lid, and you’ll have a 140 square inch stainless steel cooktop fully preheated and ready to go. 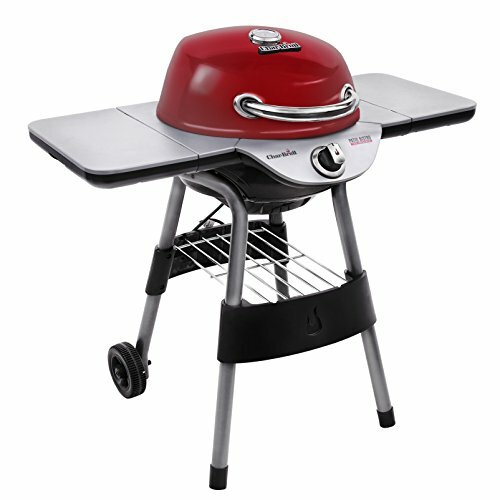 While the Solaire is the smallest grill on this list, it still has easily enough space to make burgers for six, or other medium-sized foods for about three or four. Plus, its small size brings portability: when you’re done, just close and lock the lid, and it’s ready to travel with you. Before you pack it away, though, here’s a trick for cleaning: when you’re done cooking, turn up the heat. The quick and powerful heating capabilities of this and many other infrared grills will turn any stuck-on food to ashes in a snap, leaving them easy to scrape off. The Solaire has some flexibility when it comes to fuel choices, too: though they don’t come with the grill you can also purchase accessories that enable it to run off of full sized outdoor grill propane tanks, natural gas, or low-pressure propane systems (such as those in an RV). If you want a grill you can easily put away after cooking, or one that you can take with you while camping or travelling, choose the Solaire SOL-EV17A Everywhere Portable Infrared Propane Gas Grill. While the impressive size, modern design, and seemingly endless features of Char-Broil’s Signature TRU-Infrared 420 make it our top recommendation, I hope that this article has demonstrated that the best infrared grill really depends on your needs and preferences. If you’re a charcoal fanatic, go for the Kettleman. If you like to grill on the go, the Solaire is what you want. Or if you just want to plug in your grill and never worry about replenishing gas or charcoal, opt for Char-Broil’s Patio Bistro 240. It all depends on what you want in a grill! Lastly, please leave any comments, questions, or suggestions below! What do you think of infrared grilling technology, and do you have experience with any of the grills on our list?